Russia’s military completed their “Caucasus 2012” strategic command and staff exercise in the country’s volatile southern regions. Military leaders believe the exercises validate the recent reforms of Russia’s armed forces. Generals and colonels, majors and captains had sat at computer screens and studied local maps for the days, in situation rooms and command posts, in army and brigade headquarters, and in battalion, division, company and battery command posts. At their command, the engines of armored vehicles roared, helicopters and drones circled overhead, fighters and ground attack aircraft took to the skies and the thunder of artillery and missile fire echoed across four training areas in the Southern Military District: Prudboy and Kapustin Yar in the Volgograd and Orenburg regions, Ashuluk in the Astrakhan region and Rayevskoye in the Krasnodar region. They were supported by ships of the Black Sea Fleet and the Caspian Flotilla. Troops were landed from Il-76 military transport planes in the Kapustin Yar training area. Army maneuvers were conducted from the Don steppes to the Trans-Volga region and from the southern seas to the Volga–Don Canal. In short, the joint forces of southern Russia were perfecting their combat and command skills. These maneuvers attracted a great deal of attention from around the world – and not just because the actions of the forces and headquarters staffs were observed by Supreme Commander-in-Chief Vladimir Put. Rather, international interest was piqued primarily by accusations in the Western media that the maneuvers were staged too close to the borders with Georgia, which has now had no diplomatic relations with Russia for four years. Russian generals were obliged to explain that the “Caucasus 2012” exercise was being held in accordance with a previously announced plan and were not a threat to any other countries. Colonel-General Alexander Postnikov, First Deputy Head of the General Staff of Russia’s Armed Forces, even stated that, in order to prevent Georgian speculation, the exercise would not involve Russia’s military bases in Abkhazia, South Ossetia and Armenia. Replying to accusations that the exercise had been closed to Russia’s Western partners, the Russian generals reported that only 8,000 people were involved in the “Caucasus 2012” strategic command and staff exercise. According to agreements with the North Atlantic Alliance, it was not obligatory to invite NATO observers to an exercise with numbers at this level – especially as they were being held far away from any borders with states in the alliance. When planning the exercise, the General Staff certainly took into account the difficult situation in a number of regions in the North Caucasus. “We understand the region where these exercises will be taking place, and we shall take the necessary preventative security measures,” said Postnikov. High-accuracy weapons systems that were successfully fired during the exercise included, for example, Iskander-M tactical missile systems, cruise missiles operating from various platforms, and Bastion and Ball coastal anti-ship systems. 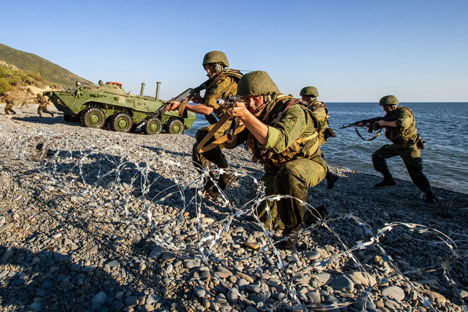 As part of the exercise, the Black Sea Fleet and the Caspian Flotilla were given objectives to ensure a favorable operating environment for naval operations, security, and joint actions with land units during a special anti-terrorist operation. The maneuvers involved the missile cruiser Moskva, several large assault ships, two small anti-submarine ships, four sea-going trawlers, two small missile ships, missile and assault launches, and also contingents of marines. Both marine forces achieved their objectives. Russia’s military leadership believes that the “Caucasus 2012” exercise was essentially a test for the military reforms that have been carried out in the Russian military in recent years – and the results showed that the reforms are moving in the right direction.